The Neurobiology of Disease and Behavior laboratory welcomes it's newest graduate student, Andrew Ortiz. As a native to Las Vegas with an impressive background in neuroscience research, the Kinney Lab is excited to welcome Andrew! Ortiz graduated from UNLV with a major in psychology and a minor in neuroscience. His research path began in the Hyman In Vivo electrophysiology laboratory under the supervision of Dr. James Hyman where he focused on investigating the systematic synchronization of brain function. Andrew's current research initiatives will include the investigation of glia cells (e.g. microglia and astrocytes), diabetes, and how that pertains to chronic neuroinflamation and neurodegenerative disease models. Welcome Andrew! Chelsea Tran and Renzo Chuapoco from the Neurobiology of Disease and Behavior Laboratory were invited to present at the summer undergraduate research symposium held at the University of Nevada, Las Vegas. Under the supervision of Dr. Jefferson Kinney and with the help of post-doctoral fellow, Arnold Salazar, Tran and Chuapoco represented UNLV undergraduate research with confidence and excitement. Presenting novel ideas linking GABA in various forms to inflammation and the ever pressing epidemic of Alzheimer's Disease. With the work of both Tran and Chuapoco alongside many other undergraduate scientists they continue to advance the research initiatives on the UNLV campus. Stay tuned for future work from the research students of the Kinney Lab. The Kinney lab welcomed Josh Gordon, a rising high school senior to join the lab for a summer internship. The Kinney lab values the development of the Las Vegas youth and is excited to offer this opportunity to a dedicated student. Josh joined the laboratory after a short internship at The Naval Academy and has devoted his summer to advancing his knowledge and scientific skill set. Josh has aspirations of pursuing a medical career after graduating high school. Josh will graduate from Liberty High School with advanced accolades in 2019. Amanda Leisgang will be joining our laboratory as a graduate student in the Ph.D. program starting Fall 2017. Amanda graduated from the University of Wisconsin-Stevens Point in 2015 with degrees in biology, psychology, and chemistry. Amanda has previously worked in the laboratory of Dr. Devinder Sandhu specializing in plant genetics and is excited to focus her attention on her passion for neurodegenerative diseases. Congratulations Amanda on your acceptance into the program! The Cleveland Clinic Lou Ruvo Center for Brain Health is hosting Dementia 2017 on June 10, 2017. Dementia 2017 is a continuing education conference focusing on the impact that head trauma, metabolic disturbances, and vascular disease can have on the onset and progression of dementia. This is a clinical based conference but is open to anyone interested in furthering their understanding of dementia — medical and health care providers, neurologists, research scientists, and students. Numerous UNLV research faculty members and graduate students will be in attendance to assist in bridging the translation gap that exists between clinical care and pre-clinical research as we attempt to further our understanding more about the clinical population that we are trying to emulate in our pre-clinical models. Additionally, sometimes it seems like there can be a dearth of science-related events, particular neuroscience, here in our Las Vegas valley home and it is important to help spread the word whenever there is an opportunity to support our health-care professionals and our science community in any way that we can. Please pass along this information to anyone that you think might be interested or benefit from attending. There is a registration deadline and fee associated with this conference so please plan accordingly. Interested in learning more about Alzheimer's disease and meeting with other Alzheimer's disease researchers, graduate students, and other neuroscience and medical professionals? The Alzheimer's Association Desert Southwest Chapter is hosting an Alzheimer's Education Conference on Thursday April 27, 2017. 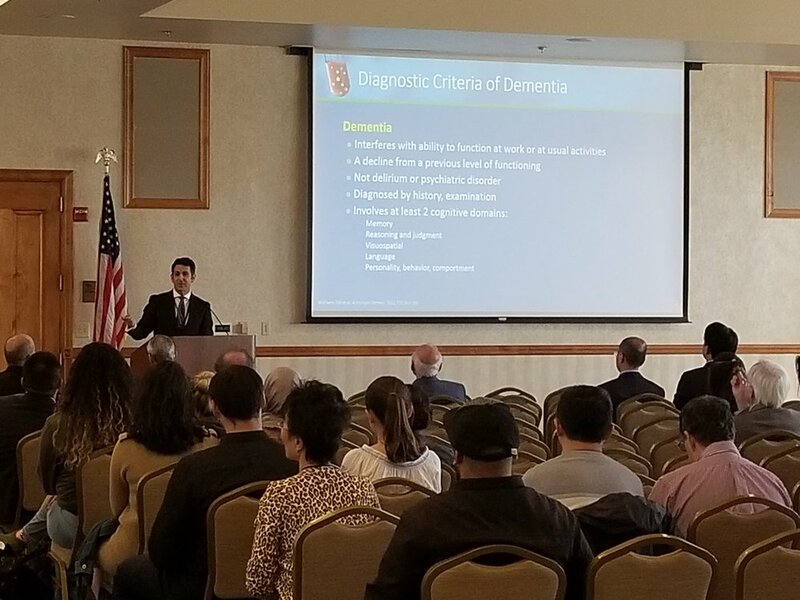 This clinical-oriented education workshop is open to anyone interested in learning more about Alzheimer's disease, whether you are a research scientist, a clinician, a student, a caregiver, or simply a member of the community seeking to further your education. You must register for the event so please plan accordingly. Monica successfully defended her dissertation and is officially Dr. Bolton now! Congratulations, Dr. Bolton! Dr. Bolton at her public defense. Another busy year for the Kinney Lab at the Society for Neuroscience 2016 Annual Meeting. This year we had just two poster presentations. Monica Bolton presented some of her dissertation research in a poster titled, "An Evaluation of GABA-B receptors in modulating inflammation." Andrew Murtishaw presented some of his dissertation pilot data in a poster called, "The effects of insulin impairments in CX3CR1 knockout mice on dementia-related pathology and neuroinflammation,"
Per tradition, we were able to coordinate a Kinney Lab dinner with our current lab members and many previous lab members — our Kinney Lab family tree is certainly growing every year. Monica Bolton in front of her 2016 SfN poster. Dr. Kinney standing in for Andrew Murtishaw's 2016 SfN while Andrew took off for a little bit to track down another poster/presentation that he didn't want to miss. Thanks Dr. Kinney! Michael Langhardt, Andrew Murtishaw, Christy Magcalas, Sheida Rabipour, Monica Bolton, Chelcie Heaney — all being great allies and supporting Andrew at the SfN LGBT Social that he hosts every year. We had the pleasure of getting together with other researchers working on our COBRE grant here in Southern Nevada, as well as those working on a separate COBRE up at the University of Nevada, Reno, in our first annual COBRE Meeting held at the Cleveland Clinic Lou Ruvo Center for Brain Health. Among the many speakers were Dr. Jeff Cummings from the Cleveland Clinic, who oversees the COBRE grant, and Dr. Bruce Lamb, from the Stark Neurosciences Research Institute, whom we work closely with on several aspects of this grant. Members from our lab highlighted our role in this grant, work currently underway, as well as data that has already been collected. Dr. Kinney gave a talk on the translational work that we are doing to bridge some of the gaps between clinical studies and animal research, Monica Bolton gave a short presentation on the project she is currently working on from her dissertation research, and Andrew Murtishaw displayed a poster on some of his previous work. Dr. Jefferson Kinney presenting at the COBRE CNTN 1st Annual Meeting. Monica Bolton presenting data from her dissertation research. Monica Bolton has been selected to receive a travel award by Amgen to attend the 2016 National Biotechnology Conference to present some of her recent work on ketamine and mTOR signaling. Additionally, Monica has been asked to moderate the session "Pre-existing antibody risk assessment and mitigation strategies" and also to be a contributing writer for their blog with a piece entitled, "From Drug Abuse to a Glimpse Into Depression." Andrew Murtishaw was selected as the 2015-2016 UNLV Outstanding Graduate Teacher of the Year. The selection was multi-tiered with Andrew originally put forward as the UNLV College of Liberal Arts' nominee before being selected from that pool of nominees from each college as the overall winner. Congratulations to Jay for winning the Las Vegas Brain Bee 2016! Students from several Las Vegas high schools competed on February 20, 2016 for an all-expense-paid trip to Baltimore to compete in the USA National Brain Bee. The winner of the USA National Brain Bee will receive an all-expense-paid trip to compete in the International Brain Bee, which will be held in Copenhagen, Denmark. Thank you to our judges and to all the volunteers involved with Nevada Brain Bee. More importantly, thank you to all of our high school participants! The judges (Monica Bolton, Dr. Hyman, Dr. Hines) deliberate during the brain bee. Winners and judges of Las Vegas Brain Bee 2016.